Gem Rocks is the latest Yggdrasil Gaming slot game release. This game uses 6 reels, 4 symbols high and comes with 4096 ways. Symbols may appear single, in block of 2 by 2 and even in blocks of 3 by 3 symbols big. If you get a winning combination, the winning symbols are removed and new symbols will fall on top to create the option for another win. After 2, 5 and 9 consecutive wins during one spin you will be awarded with special Monster Rock symbols. These Monster Rocks will be added to the reels and will always award a winning combination. The Monster Rock symbols will increase in size each time they hit. After 2 consecutive wins it will be a 2 by 2 symbol, after 5 consecutive wins it will be 3 by 3 symbols and after 9 consecutive wins it will become a 4 by 4 symbol. Because of the guaranteed wins during the Monster Rock symbols, especially the 4 by 4 symbol can award huge wins. I really enjoyed this game. It’s a pretty simple concept, but the game did keep me interested and it also awarded some nice wins. The 9 consecutive wins are very rare, but 2 wins in a row happens pretty often and can also award some good wins from time to time. 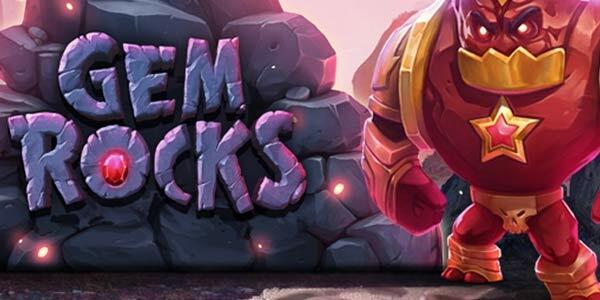 As with all Yggdrasil Gaming slot games, Gem Rocks looks amazing and is definitely worth a try. I haven’t seen this new game at all casinos yet, but it is available at Casumo. Which is always one of my favorite online casinos. Check out Gem Rocks for yourself at Casumo, for free or for real.